Daniel Licht created the music for Dexter. He is not the typical slasher thriller or horror scare-fest. "It has an ironic twist," Licht said in an interview. "The music plays it straight when there is danger. But most of the dramatic danger is not about the killing but about Dexter getting caught. In many ways it is more like a stalker movie. Because you are not supposed to be scared by Dexter. 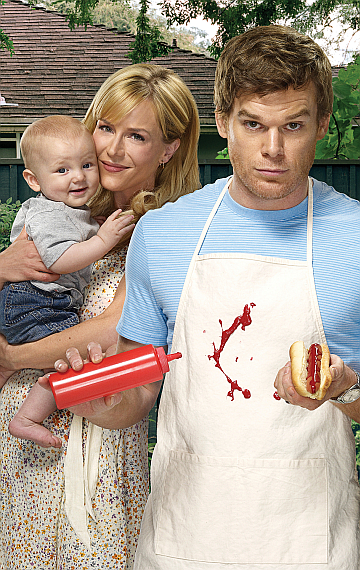 Dexter is a kind of hero." The score for Dexter is so popular all eight seasons have released individual soundtracks and Licht has performed the music in concert before live audiences. "I started doing live concerts two or three years ago," he told me. "I did a series of concerts, at and one of the ladies who organizes the Krakow film festival asked if I would like to come over and perform." He adapted the 90-minute 18-musician version to a full-on suite for a 60-piece orchestra with choir, about a hundred people on stage. He decided not to show any footage from the series during the concert. "I concentrated on making it a performance. So that is why I incorporated different sounds like bowing and glockenspiel. And I brought in vocalists and we did percussion with odd instruments, even saws and hammers." That also included wine glasses, played by Licht himself. "I find that at a lot of the soundtrack concerts, when they show too much video, it could actually distract people from paying attention to the music. I actually want people to watch us performing." "Dexter is generally not orchestral. I use strings a lot, but for the most part, it is percussion and harps and pianos and voices and a lot of random odd instruments like didgeridoo and celeste. I used very little brass or wind. To arrange it for orchestra I didn't want the people sitting there doing nothing. So I did give them parts here and there, but I didn't want to change the nature of the music too much. It was an exercise in restraint, really, not adding a bunch of instruments to it. I didn't want it to sound like a Muzak version of Dexter. Licht told me about a very Dexter-like gruesome twist at the wrap party following the filming of the final episode. "Of course for the wrap party they had done up the whole place with blood dripping all over. They asked me to perform and I brought a small group. I thought I would do what I use to start off the opening piece of the concert, by playing the knives. I usually turn the knives around so that I am hitting the dull ends but I did it backwards and I actually cut my finger right at the beginning of the concert. I think that everybody thought it was just a gag. And so in the middle of playing the theme for Dexter, I grabbed a piece of duct tape and bandaged my finger as I was playing. I was just trying to keep blood from dripping on my suit!"